At least one man thinks Israel fought the war in Gaza this past summer in a compassionate manner. General Dempsey declared to the Carnegie Council for Ethics in International Affairs in New York that Israel went to “extraordinary lengths” and far surpassed normal protocol to protect Gaza’s civilian population. Yes, over a thousand Palestinians died and much property was destroyed, but we can thank the terrorist organization Hamas for provoking Israel to war by the continuous unprovoked firing of missiles into Israeli civilian population areas. Israel’s retaliation against Hamas included bombing sites of determined targets from which Hamas was firing rockets and missiles into Israel. These sites included UN schools, hospitals and other populated areas that Hamas used as launching sites for hundreds of missiles fired into Israeli civilian population centers. General Dempsey praised Israel’s effort to limit civilian casualties. The Israeli military had “no desire to destroy civilian life” and warned Palestinian civilians of incoming bombs before they were launched. Dempsey is convinced that Israel’s compassionate approach to fighting this war is worth emulating. He has now sent a military delegation to Israel in order to learn the methods by which civilian causalities can be limited. 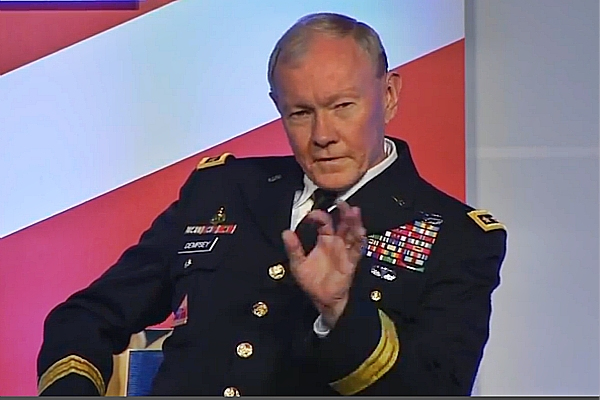 Why are the comments by General Dempsey so important? In light of other world leaders who have criticized Israel’s lack of compassion for the Palestinian people, the General’s enlightened comments bring a degree of redemptive purpose for the way Israel fought this war. Political leaders will likely not yield their position against Israel after hearing Dempsey’s evaluation and comments, but they should. Dempsey’s credibility as a soldier cannot be disputed. He will judge between the nations and arbitrate for many peoples. Then they will hammer their swords into plow-blades and their spears into pruning-knives; nations will not raise swords at each other, and they will no longer learn war. their homes were destroyed. IT WAS hAMAS THAT JEOPARDI ED Ga a civilians by placing military weapons in their schools, hospitals, and homes. That is the meaning of dastardly behavior. Which includes murdering school children on their way home from classes. How do you make peace with these soulless people? You’re a real deep thnerik. Thanks for sharing.